It’s interesting to see how many children have been interested in learning Spanish since La Dante started introducing it in January 2017 as part of the European languages offered. There has been a noticeable increase in schools offering Spanish in the past 10 years overtaking from French and German. It’s not surprising as Spanish is spoken in 20 countries and there are 400 million Spanish speakers in the world. There are different strands of Spanish and it’s interesting to know that at La Dante you are offering Spanish with teachers from Spain as well as South American. I understand that there are a number of students who wish to go and travel or work in South America who need to get accustomed to this particular accent. There are some differences in pronouncing Spanish words or addressing people with ‘vos’ or ustedes’ or even ‘s’ that is not pronounced in some parts of South America. We wish to offer all this at La Dante and in fact our children are exposed to different accents as our teachers come from Spain as well as South America. Do you teach Spanish to children as well as adults? Of course we do. Here at La Dante, we teach Spanish using a communicative method, combining realia (objects from real life) and lots of songs and games to make learning much more fun. Our ten-week programme for children is designed to cover main topics such as animals, food, colours, numbers, members of family, clothes, etc. where children learn vocabulary and small sentences in context. I encourage and give confidence, they earn special points when they do well and the topics are always relevant to their lives and their world. So how would you structure a typical class? Cristina: Say, for example, that we are learning about animals: first, we listen to a couple of Spanish songs about animals to help children learn and remember the main vocabulary of the lesson. 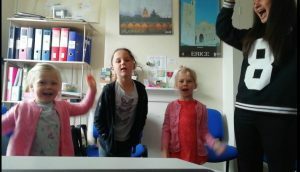 For every song, we learn the lyrics and some moves so we can sing and dance all together, because linking words with movements makes learning much easier and way more exciting. They have to dance and follow the teacher’s instructions, like clapping, move their feet, or shout Spanish words. Then, once the children are acquainted with the new words, we start to use them and consolidate them by playing games with farm-related toys and farm bingo. Our children are fully immersed in the Spanish language for the whole duration of the class, having a fun with other children of their age. The target language is spoken at all times. What do the children love the most? Cristina: We usually play the same song both at the beginning of the class and before saying goodbye, so that the children are able to remember the lyrics by the end of the lesson as well as the majority of the vocabulary learned that day. Using realia means that we use real objects during the teaching sessions: children learn about clothes with actual clothes that the teacher shows in class. So it’s a ludic approach? Cristina: Yes indeed, for children who have beginners level of Spanish, the focus is on playing, especially with children as young as 5 who come to La Dante to learn Spanish. We play Spanish games like The Hopscotch to memorise colours and numbers: the teacher asks them to throw a ball into different squares drawn on the ground linked to different numbers and colours and the children have to jump onto the squares, saying colours and numbers out loud as they play. One of the games we have noticed children enjoy the most is a role-play in which each of them plays a member of the family in a toy house. Furthermore, among other activities we also do arts and crafts: for instance with like or dislike, I hand out a green paper (likes) and a red paper (dislikes). When I say Me gusta el tomate the children have to draw a tomato on the green paper. Our children also enjoy our picnic time! We simulate a picnic where they have to list food they would like to eat, always in Spanish. Do you also have a bilingual Spanish group? Manuel Orta Simón (Spanish teacher): we certainly do and in fact, I am the main teacher. In the current bilingual class, the parents expect the children to improve their fluency level so when their cousins come and visit from Mexico, they can have a wider range of vocabulary, a better way of expressing themselves with grammatically correct sentences. In general, they wish their children to achieve confidence in speaking Spanish as here of course, going to an English school, they have fewer occasions to use their second language. What kind of topics and activities do you do with bilinguals? Manuel: we certainly focus more on grammar for the older ones, we watch sketches on Harry Potter the children love as well as their favourite sport. At the moment they love Nadal at Wimbledon and we introduced specific tennis vocabulary so they can talk about this with their cousins. We also go to Museums and talk about a variety of topics: we went to the Polar Museum where they wore a special polar suit so it was great for them to develop a variety of new vocabulary. They are motivated and great to teach, they come along with pleasure. What is the main message for parents who wish their children to be fluent in another language? Giulia Portuese-Williams (Director and founder at La Dante): We encourage parents to speak their own language at home and inspire their sons and daughters from day one. It’s a gift for life and their children will be thankful forever. When they are young, before turning 5, if exposed to another language, children learn with no effort. 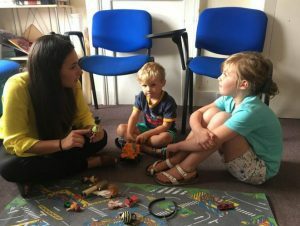 Research shows that bilingual children offer a wider variety of solutions related to problem-solving, a lot more than the one solution given by a monolingual child of the same age (in set experiments). Of course, there is no age limit to learn a language and any age is as good. We encourage parents and children to join the Spanish community so the children are aware that it’s a language that is spoken within the family and among friends. The secret of success is to get the children involved in a school with the right language approach to teaching, join the community with other bilingual parents, read books in Spanish, watch a few videos in Spanish and of course travel to Spain to visit friends and families. My boys certainly loved their visits to their nonna in the South of Italy by the sea and Lorenzo had a special experience in an Italian school for a week for two years as they are bilinguals in English and Italian. I certainly encourage parents to give their children an equal experience in a Spanish school for a short or long period as making friends is special and language, at last, means a lot to them. News: In September we are introducing Singing in Spanish for children with an Argentinian teacher Lorena Garcia who has a Performing Music degree specialised in singing from the Univesity of Buenos Aires in Argentina. We certainly encourage parents to offer this special skills to their children should they show a talent for singing. At La Dante, we thrive in creating a great experience where children get to love the Spanish language and learning becomes a real passion, a drive that comes naturally over the years.